Autumn is traditionally the season of plenty: the time of year when we harvest crops in preparation for the long winter months. With freezers, 24-hour supermarkets and so much imported food, this is no longer a necessity. What we may have lost though, is the understanding of the seasons and their effect upon our diet. Just one week of eating seasonal foods - grown in the UK - and not whatever takes our fancy from the supermarket can be a real eye-opener! The following recipe uses fresh flounder; which is at its best between September and February. Flounder is a flat fish, like plaice, dab and turbot and usually sold whole or filleted. The shallow bodies of these fish, which have tender but firm flesh, make them ideal for grilling, baking and sautéing. Grease an ovenproof dish with butter then place the fish in your dish and sprinkle it with the vinegar and a little sea salt. Melt the remaining butter and pour this over the fish. Bake as it is for 10 minutes. Peel, core and grate the apple. In a medium-sized mixing bowl, stir the horseradish and apple together. Next, add the soured cream. Stir the ingredients together and add a pinch of salt and sugar. When the mixture is well combined and fairly smooth, remove the fish dish from the oven and pour the sauce over the fish. Return the dish to the oven and bake for a further 15 minutes. Best served with plain boiled potatoes as the sauce has quite a bite to it! Any strong-tasting vegetables detract from the flavour of the fish so keep accompaniments simple. 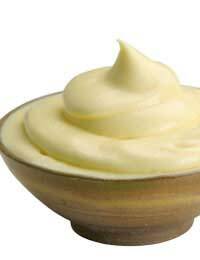 This garlic mayonnaise makes a very tasty alternative to the horseradish sauce. It goes well with the flounder-as cooked in the above recipe-as well as grilled fish, or fish in breadcrumbs. This is a useful choice of dip to serve with fresh fish goujons. Place the garlic in a small bowl and mash it until it forms a paste (use a pestle and mortar if you have them). Next, beat in the egg yolk and mustard. Pour the oil in and beat vigorously with a wire whisk to make a smooth thick dressing. Cover the bowl and serve immediately or refrigerate for same-day use. This spicy little number is great with baked lemon sole or flounder. Grind all the ingredients together in a mixing bowl/food processor, or with a pestle and mortar. Make two diagonal slashes on each side of the fish and simply rub the masala sauce into them and all over the body of the fish. Wrap each fish in buttered foil. Bake for about 25-30 minutes. Serve with plain rice and slices of lemon/lime.